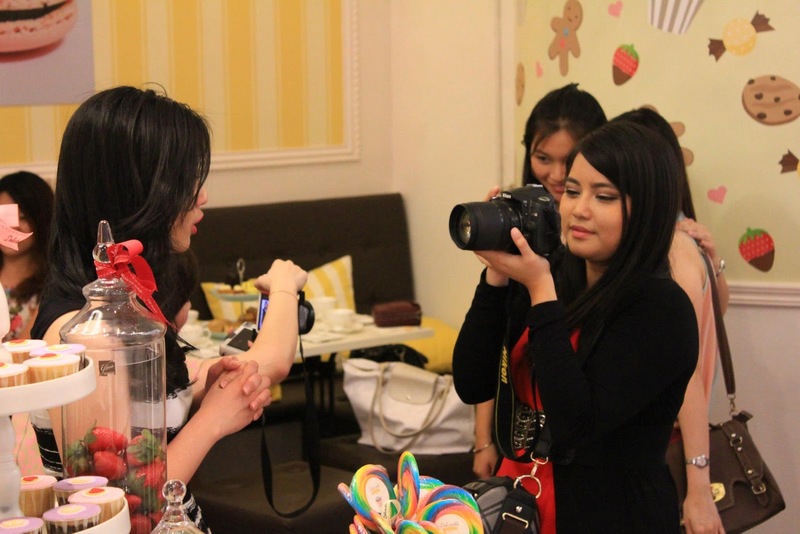 So the event took place at Delectable Treats by Su at their Paradigm outlet. It's located next to Tesco right in front of Delifrance. If it's your first time at Paradigm, I suggets using the elevator coz there are so many levels I was almost lost and it wasn't even my first time! LOL. Anyway, I'm glad I was on time, though not many people where there yet, so I took the opportunity to take some photos and start recording. It's saying, please eat me! The first person I saw was Tammy! I was so nervous. I mean, I never thought I'd be meeting people I knew online and specifically the blogger I have come to admire. She's approachable and friendly :) After a brief introduction I continued to take pictures and record some clips. Before I knew it, the place was getting more and more crowded with bloggers, some I recognize and some I wasn't too sure. That's me interviewing Mi Mi, photo from Tammy of course! I finally saw Mi Mi, the founder of Bag of Love. For those who don't know, Bag of Love is a one woman show, unlike other beauty boxes, Mi Mi handles everything by herself with the help of her family and friends. It is not a big company with many employees to help with the business. She was a beauty writer for a few magazines (female magazine was one of them), and her first Bag of Love launch was the Debut Bag in March. Before the event, Tammy mentioned in The ButterFly Project that we should take advantage to get to know Mi Mi. I haven't actually thought about doing an interview, but she was right! Where was my brain hahaha. And of course, I asked Mi Mi if it would be alright to interview her. She was alright at first but after seeing the playback she suddenly became really shy, said she didn't look nice on camera. I just looked at her thinking "umm what???? you look so young and beautiful", but to keep her wishes I kept her interview in the video as short as possible. What better way to learn than from those with the experience. With Mi Mi, she advice not to give up on the first obstacle you face. She's right. I always hear people say the hardest part is the first step. But I believe that the hardest part is to not step back and to keep on going. She shared her experience that she started Bag of Love as a compromise to continue her passion in the beauty industry and at the same time to spend more time with her children. It did not turned out that way, "in the end I[she] have absolutely no time for my[her] kids". She regretted the decision but she didn't give up. Now that things are more under control she finally have the time she promised her family. I remember this more clearly because I was sitting right next to them during the event. I put my camera aside for awhile to get to know them a little better. It was really interesting to meet different people that shared similar intrest. You never really think about the life aside from the pages we read and the videos we watch. It was a pleasure to get to know them. Some are married while others have day jobs that are completely different from what they blog about. What I learned is that behind the words, pictures and videos, they are just like everybody else. They work hard and make effort to balance their life with the things they love. So it's possible to still do whatever that makes you happy. LOL it was hard to focus on what was inside the bag coz everyone is laughing (as you might have seen in the video :P) and it was extra hard for me as I was holding up my humongous and heavy DSRL camera with one hand and had to switched hands a few times. "Hmmm....what is this?... ""Oh...what does it do?... ""What can I use with it for?" So what do we have in April's Bag of Love? OMG it was so good. I noticed everyone was enjoying nom nom on the food :D I really think it is a very good place to just sit back and relax with a cup of tea surrounded by great companies. If Su was there I would have loved to interview her, but she was pregnant and was very close to the due date. She had a baby boy btw ;) Go and wish her a Happy Mother's Day! The collectable limited edition fabric button badges! After filling my stomach with scoops of pure happiness I asked Tammy if I can interview her. She was very fun and engaging even though she kept saying she was camera shy but the camera loves her! I wanted to know a little about her background so I asked her how she started blogging and why. I also asked her to give an advice to inspiring bloggers out there. You can see the details in the video of course ^^) When Tammy said that us bloggers need to stick together and she will "fend the bullies off! *smiley face*" I felt she was like a big sister. 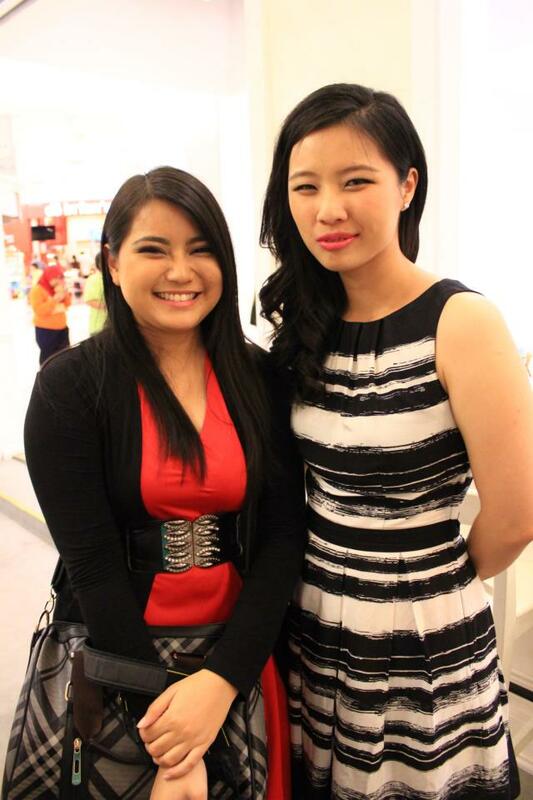 I'm happy to get to know her and just like Mi Mi, my admiration towards Tammy also grew. Continue on with the event, I got to know Sabrina from Vixen Deity, Lina from Miss Babble Gloss, Angeline from Average Angeline, Li Chuen from Strings of Memories and Emily from Sunrise Emily. I think you can tell by now that I look up to those who are not afraid to chase after their dream and just be themselves. The first time I saw a picture of Lina in one of her reviews I thought she looked so pretty :D We all have grown to believe that beauty has a certain type of image and anything less of that is not considered beautiful. So, whenever I meet or see anybody who is so comfortable, confident and happy in his/her own skin, I automatically admire them. I believe that this is the kind of beauty we should grow to appreciate and looked up to. It was such a pleasant event, getting to know people who are nice and sincere. That's rare. Or have I not met a lot of people like that all at once? LOL. 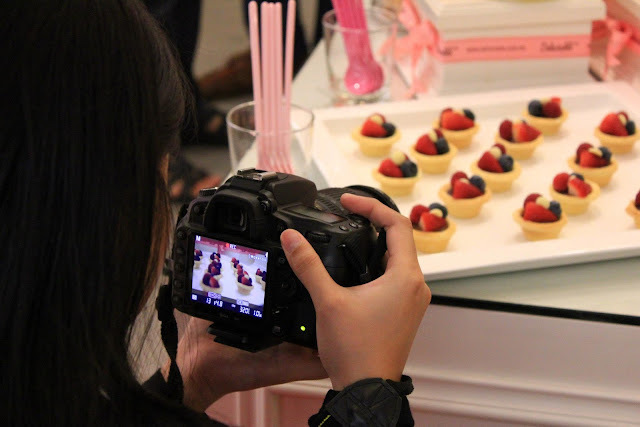 Before I end this post (I know, so long end it already haha, bear with me :P) I would like to thank you Tammy, The ButterFly Project, Mi Mi, Delectable Treats by Su plus the wonderful staff and of course, everybody who made the event memorable.